The two men were sitting in the Club room of the 50 year members favorite drinking establishment. He had been coming here since he was a young man when his father first brought him there. It was a place of manly bonding with his father. Over the years the old man brought each of his sons on their twenty first birthday. He wanted the same experience with each of his sons that he had experienced with his father. He knew that his sons would go out with his friends later in the evening and have their first experience of trying that which was once forbidden to them but he wanted to bond with them and teach them that enjoying a quality beverage in an upscale establishment was just as fun as drinking in a loud watering hole, and maybe even more so! Men had been visiting the club for over one hundred years. Although updated throughout the century the place still held its charm. 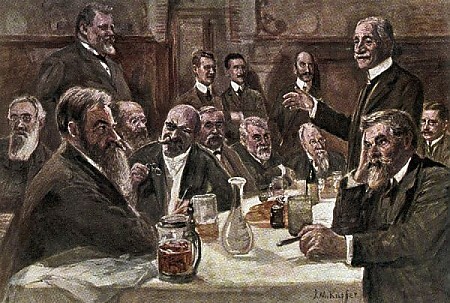 The polished dark wood covered walls gleamed in the low light of the room, paintings of members from long ago watched over the room giving their approval that the current members still held their club in reverence. In the distance you can hear the clinking of billiard balls in the next room where several gentlemen were playing a friendly game. As the old man and Pudge was sitting in their leather wing backed chairs discussing the previous evenings events a waiter dressed in formal attire approached “Excuse me gentlemen” The waiter said “Mister Johnson, your table is ready. Shall I carry your drinks to your table?” The old man nodded as the white gloved hand gently picked up their drinks and placed them on a highly polished silver tray he was carrying. “Please follow me Gentlemen” the waiter said as he led the duo to their table in the restaurant. As they walked though the building Pudge's eyes went wide with amazement as he walked though the ornate building. The old man leaned back into his chair. “To be honest Pudge that is one of the reasons I invited you here today. I wanted to illustrate something to you. Masonry doesn't have to sell itself at bargain basement prices to be successful. If you give a man quality he will gladly pay for it. This club has been going for nearly one hundred and fifty years and shows no signs of slowing down. We have to find a way to raise the bar of the lodge. 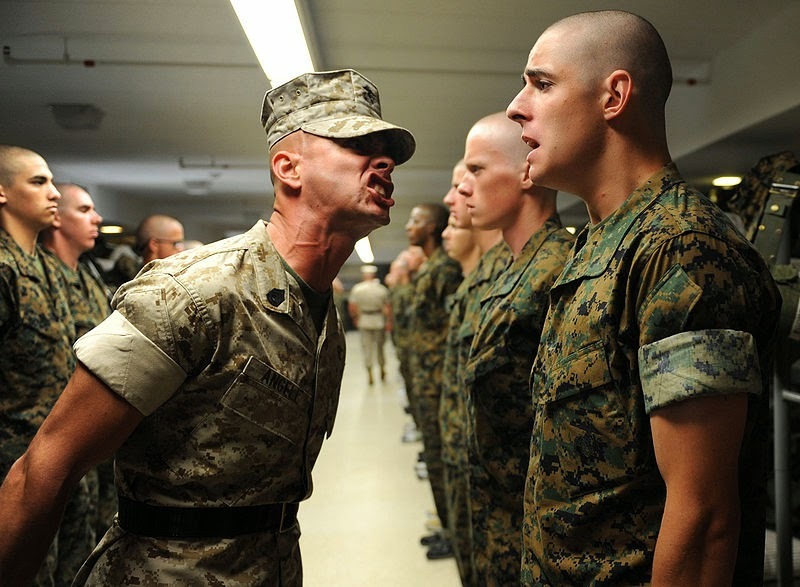 Give the men a reason to want to join and once we have them in the door make them want to stay!" The 50 year member smiles “I'm glad you like the place Brother. That is the other reason I brought you here today. I had a feeling you would like this place. I have never done this before, other than for my sons. But I would like to propose you for membership to this club. I know you are someone who would enjoy it and use the membership to it's fullest. A tear started to run down Pudge's face as he wiped it away with a napkin “I don't know what to say” Pudge said in a weak voice.” The 50 year member playfully punched Pudge's arm and laughed “Don't say anything son. Drink your scotch and decide what you want to eat. Once we are done here I will take you to the billiard room and beat you at a game of pool. Wait. I will school you at pool! I think that’s how you kids say it.” Both men laughed. While traveling to Michigan from Oklahoma I was forwarded the opportunity to stop in Illinois and visit with Brother Robert Johnson. It was planned ahead of time to visit with him the first opportunity I had. It was long over due considering we have been writing for this blog together, quite sometime now. The opportunity just never presented itself with me being overseas when I started contributing to The Midnight Freemasons and being stationed in Fort Sill, Oklahoma for the remainder of my Army career. When I called Bro. Johnson I was already in Missouri traveling North ready to meet with him and his family. He answered and propositioned me to stay over the night and go to the first ever Masonic Symposium in the Midwest being held at Pleiades Lodge # 478. The trip to see Bro. Johnson, turned into an educational experience where I was able to meet many different faces of the Craft including Bro. 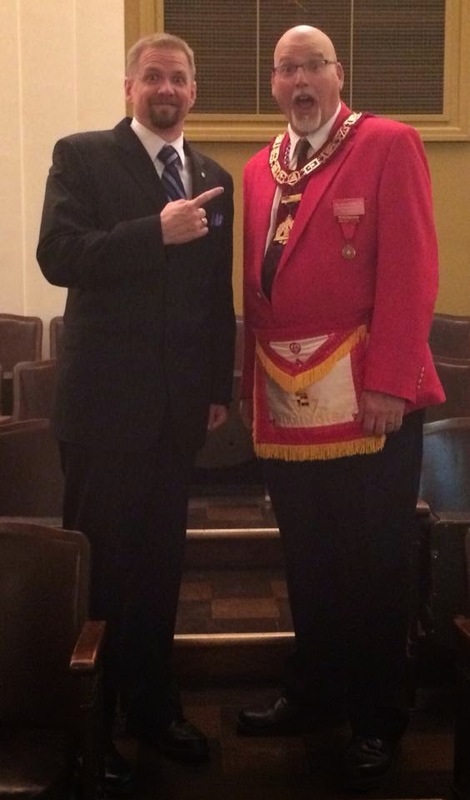 Brian Schimian and the newest Midnight Freemason, Bro. Robert Walk. The first day I was in Illinois, Brother Johnson had to work and was going to be gone well into the night. I came to the Johnson’s house to be greeted by a couple rambunctious kids, RJ’s mom and the awesome Cori Johnson. With all the action going on in the house, I wonder how Brother Johnson finds time to work on Whence Came You, Iron Mike Magazine and this blog. He is truly talented when it comes to balancing family, work and Freemasonry. A short while after I was welcomed into the Johnson home Bro. Schimian walked through the door and gave me a nice Fraternal hug. It was a pleasure, yet again, to meet him finally; especially after our long conversations starting back when I was deployed. He took me out to dinner to celebrate being a free man no longer in debt to the United States Government. Of course, while at dinner we couldn't stray away from talking about the Craft. We talked about everything under the sun but it always came back to the thing that brought us together in the first place: Freemasonry. The next venture for us in this great friendship we have built was the Symposium. I am not going to take away from Brother Brian Schimian’s article, his article explained it quite well. It was a great time and met some great people that I have talked to for a long while, almost as long as I have been a Mason. It was humbling when talking with brethren, who I have never had the privilege to meet or speak with before, talk to me about things that I have written. When Brother Charles Harper Sr. shook my hand and greeted me like we have been friends for years, despite our differences and beliefs. The whole experience in itself was enlightening and opened my eyes to different ideas in the world of Freemasonry. Opened them so much that Brother Robert Walk and I talked about an idea that we both came up with separately. Granted, we had different thoughts about the idea but overall we had the same idea and just needed to discuss what our plan of action was going to be. With so much happening in the world of Freemasonry, I am blessed and honored to be working with some of the greatest minds in the Craft that I know today. From those who spoke at the Symposium, to those who write their own blogs, and to the men and lady who write for the Midnight Freemasons. Thank you all for showing me how great this Fraternity is and can be in the future with us working together. Bro. Aaron Gardner , an American Soldier who just recently transitioned into the Reserves after 8 years serving the Active Duty Army. He dedicates the majority of his free time to Freemasonry with his constant studies, writing and traveling from lodge to lodge to learn as much as he can regarding Freemasonry. He likes to relate his everyday life to the Craft and anything he finds he wants to spread to the world. It is his passion to study people, religion, history and Freemasonry. When he isn't working as a Soldier he is dedicating his time to the amazing and supportive Emily, writing about Freemasonry and writing his very own novel. His blog page is Celestial Brotherhood. As I went through my “ho-hum” routine as I was waiting to begin my new employment venture into outside sales, I begrudgingly removed myself from the horizontal position on the couch and fired up my laptop to play around on the inter-web. That just happened to be a few minutes after Brother William Hussey Jr. posted a link to about the “Illinois, Iowa & Wisconsin Tri-State Chapter Day” that was happening the next day, Saturday, May 3rd, 2014 in Freeport, IL. Bro. Hussey stated in this post, “Be there and see me!” Well, it just so happened that I was particularly vulnerable to a challenge at that exact moment. Besides, THE (Larger Than Life & Living Legend) William Hussey Jr. was going to be a mere 30 minutes from me! Not only was it a mission of mine to receive the York Rite degrees, but it would have been simply incomprehensible to allow such a “Legend” to be in the proximity of my home and not make every possible attempt at being in his company. I immediately responded to Bro. Hussey’s post inquiring what I had to do. This sparked a tirade of private messaging and text messages to get things lined up. Being that I had yet to join a Blue Lodge in WI (my home Lodge is in IL), I was not able to petition a York Rite or Scottish Rite body. Jurisdictional… “issues”… However, in just over a week I would be attending my local Blue Lodge, Becknell #94 F&AM and seeking a Plural Membership. This brought Bro. Johnson into the plan. I would be petitioning the York Rite under the Charter of Waukegan RAM #41. It was short notice, but hey, they always order more green beans than they need for Masonic events. There should be plenty of room for one more. Suddenly I went from extreme boredom to uncontrolled excitement. It probably didn’t help that I was getting coy messages from Bro.’s Hussey and Johnson… After all, I should have been done with all that goat nonsense years ago! But Brethren being as they are, I had a “surprise” waiting for me Saturday, I just didn’t know what or when. Kudo’s Brothers! I was up well past 2 AM that night. Several things contributed to this, but I won’t go into them here. We will just say that if you ask, you shall receive. I even ended up hearing from an old friend from my DeMolay days that I had recently been thinking about. “This thing of ours” really never ceases to amaze me. Sometime long after midnight, I remembered that at some point in the initial degrees of the York Rite that I would have to create a “mark”. This would be My Mark for eternity, so I wanted to get it right the first time. I began crafting different designs, researching different things and scratching different ideas. After all, if a “Mark” doesn’t mean something, what is the point of making it, right? 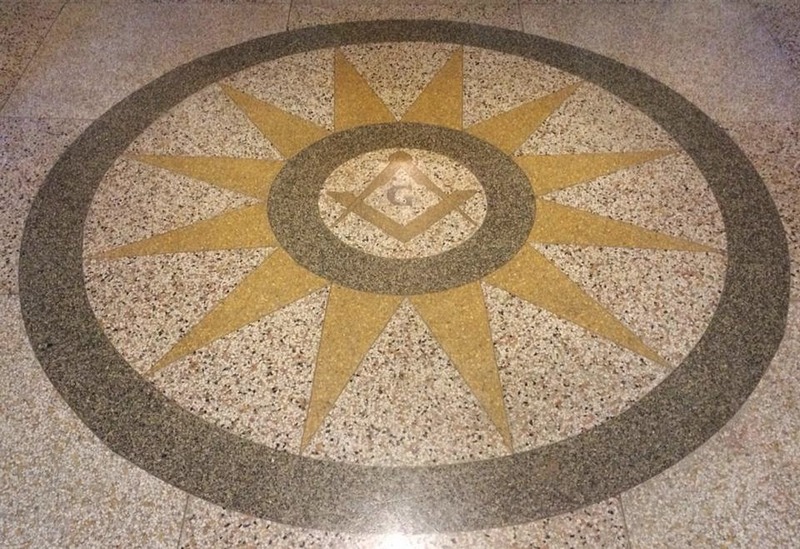 Well, eventually I was able to cobble together several different symbols and create something that would stand the test of time while meaning something to me, as well as any other Mason that saw it. Beginning with an early version of the Crusader’s Cross, I added Pillars, a Right Angle, Parallels and a Perpendicular. To me, it is all encompassing of our Craft. At just after 6 AM, my eyes popped open and I saw the light coming in around the shades. I was wide awake and refreshed. I got cleaned up and donned my favorite pin striped suit and shirt, French Cuffs, of course. I jumped in my truck and headed south not knowing what to expect, other than another adventure in Brotherhood. As I entered Freeport, I was struck by the architecture and age of some of the buildings. Being that I had made the trip a little faster than I should have, don’t judge, I took a few minutes to ride around and take in the sights. As I parked in front of the Freeport Masonic Center, I was taken aback, like I am every time I see a majestic building that is dedicated to the Craft. The towering stonework and pillars are always beautiful to me. I made my way inside and got registered. When I say everyone knew Bro. Hussey, I mean EVERYONE and there was no shortage of jokes to go around. I hung around the lobby saying hello to many new Brothers and checking out the regalia in the halls. Eventually, Bro. Hussey decided it was time to grace us with his presence at the Temple. I will admit, as I saw him enter the lobby, I did say to myself, Cripes! He is larger than life! Even though this was the first time taking Bro. Hussey by the hand, it felt as though I had known him for an eternity. Even if he may wear his ring upside down… Bro. Hussey even took his 2014 IL RAM pin from his own jacket and presented it to me. To say I was thankful or even humbled would be the understatement of the millennium. The degree work began and I was intrigued from the get go. I love “this thing of ours” and take every opportunity to absorb as much as I can. Up to this point, aside from the Shrine, it had been almost 16 years since I sat in a Lodge Room as a “candidate”. The Fourth and Fifth Degrees were interesting, to say the least. Then we broke for lunch. This was the first time I had a “Masonic Meal” and there were no green beans. Just Saying. I must say though, there was still the looming “promise” from Bro.’s Johnson and Hussey. When they were asking for volunteers I happily obliged and said I was willing. The Brother just laughed and said that, “you are already taken care of”. What in God’s name does that mean?!?! Suddenly I had second thoughts about that potato salad I had just ate! After lunch was the Sixth Degree, which was interesting, and then, “go time”. It was the Seventh Degree and those promises were coming to be. I was instructed, along with two other Brothers to “be ready” and meet in the preparation room. As “luck” (or divine “Hussey” intervention) would have it, I was the number one exemplar, the first of three in line. We were tied to one another with the Cable Tow and eventually hoodwinked. as the blindfold was paved on me, time seemed to stand still. The conversations of the others behind me faded into the distance and I began to reflect. I was taken back to my childhood, helping my father and the rest of the great men making ready for a parade. The multitude of installations, picnics and Brethren from days gone by flashed before me. I could have swore that if I reached out, they would have been there. Suddenly I was 13, in the preparation room, wondering if I would be voted in to the Order of DeMolay. Then, peace. I don’t recall hearing anything that called my attention, just a calming peace with memories of my father and his father. It had been 16 years since I knelt at an alter and took the solemn vows in the presence of my Brothers. Today it was a very humbling experience and an honor to have been again on bended knee, my hands upon a Volume of Sacred Law, swearing an obligation to the Craft and my fellow Companions of the Royal Arch Masons as I began my journey through the York Rite. Surely to most, this is just another example of earning that masters wage. But I, for some reason, as I am sitting here reflecting on the day, can't help but be overwhelmed by the Brotherhood that just continues to prove itself to be endless. “Blessed” does not even begin to describe how I feel at this moment. The only thing I would change about today, the one thing that is unchangeable, would be having my father beside me for this journey. Even still, I know he was with me in Spirit. Brothers, I come before you as a humble person with simple beliefs. I could go on and on with analogy after analogy about this life, certainly my own past six months. But let me just narrow it down to this, “If It Is Meant To Be, It Will Be”. If you have read my past entries, you will know that many opportunities associated with the Craft have presented themselves to me, basically at the last minute. I always try to truly think about my actions before I do anything. These instances, when I really think of them, give me nothing other than a feeling of peace. As if I was talking directly to the Supreme Architect of the Universe and Hiram himself was leading me by the Cable Tow. As I breath air into my lungs, I would give it all for you to have spent today with Butch. He understood more than he let on and certainly enjoyed the Brotherhood of the degrees more than anyone. But, being that I have been burdened with traveling without him at my side, I must pause and give thanks that you all have welcomed me. Brothers... Nay... Companions, Thank You. I am beyond humbled to have been received and included in these degrees of York Rite Freemasonry. I look forward to continuing my Journey into enlightenment with you. I may live by myself, but I surely never feel as though I am alone. Virtue has united us all, and nothing shall take that away. Until we are able to again meet upon the Level, may the Supreme Architect bless you and be with you on your journeys. As I turned onto Orville Road via Eastern Avenue I was only a tad bit nervous. Just enough to grab the shifter of my bean can of a car with three white knuckles tightly clenched around it. As I rounded that corner I felt the caffeine stimulating my hyper-sensitive nerves to the point where I could feel my heart nearly beat out of my chest. At least it was pretty outside. Today is the day that I would return all three degrees' catechisms, in a row, to the Deputy Grand Lecturer, Past Master Gus Vorvoulas. I always saw him as sort of a mythical creature. 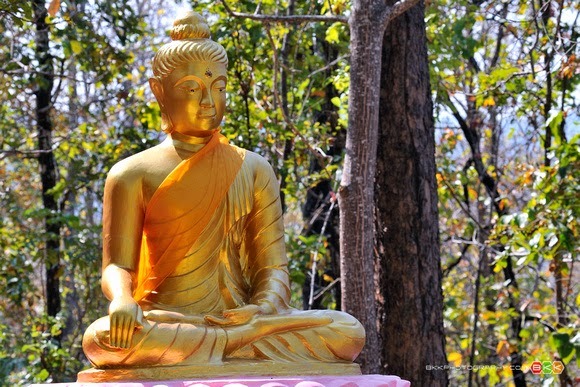 Not dissimilar to a jade Buddha statue in the deep thick of a middle-of-nowhere forest. I only saw him during officer line practices, and maybe one stated meeting every two months. Somehow everyone always spoke of this Past Master. One Brother that I met far and away from our lodge even told me to tell him, "hi Deputy" in his name! Who was this man, really? And just the fact that the first time we would have a serious one-on-one would be a very brain-tingling return of the degrees was nerve-wracking! Up until now I was highly dedicated to the catechisms. Word-for-word I would repeat the answers to the questions during my breaks and downtime at work. I knew them like I knew my own face. 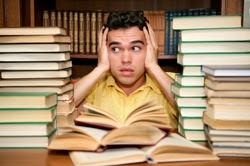 What would save me on this day, however, was the fact that I also memorized the questions preceding them. I was able to go through the whole series, open to close, on my drives to and from work…but then I was Raised. I became proficient in the 3rd Degree and more or less dropped the work. I became dedicated to what was happening within the walls of our building. The socializing, prepping for dinners, and learning the floor work for Senior Steward became my primary focus. The catechisms were, in so few words, behind me. I was then approached by the Worshipful Master to do catechism instruction. I had confidence I could completely it, but several weeks went by before I could meet with the Deputy Grand Lecturer to "certify" with him. By the time I was able to schedule our appointment with Past Master Gus, I very hurriedly had to look over my ritual monitor again. His only chance to meet would be -- you guessed it -- that very day. We both stood up out of our cars, gave a rather "healthy" grip, and he finagled the door of the lodge open with his very "janitorial" looking key. This really could not have gone any slower. I felt the beads of sweat drip down my chest under my windbreaker. We took three steps into the lodge as he said, "would you lock that door behind you?" And his words reverberated through my skull like a judge telling a thief he would be sent to prison for the next 10 years. "Past Master, I'll be honest with you. I'm really nervous." He laughed a little bit and told me not to worry about it. He asked me about how I was enjoying my experience. Did I enjoy the 3rd Degree? And the topic at the forefront of my mind lately: Masonic Education. We must have sat there for 25 or 30 minutes simply bantering and bickering back and forth! And I'll be darned if that didn't near-immediately calm me down. "Well, are you ready," he asked. "Am now. Let's do it." Now I'm sure you think I'm going to tell some fib about going straight through them without stopping. Well, I didn't. I had to eat some humble pie that day, because the latter half of the 2nd Degree was nearly lost to me. I did the Entered Apprentice. "Good." I did the Master Mason. "Good." I tripped over the Fellowcraft, but I called him the very next day and we did it over a phone call. I finally found myself able to do the work that was so generously passed onto me. This Thursday evening I'll visit another lodge with Past Master Gus to witness the Knights of Mecca Raise a Brother to the Sublime Degree of Master Mason. There he'll serve as the Worshipful Master. It will undoubtedly be a sight to behold. Bro. Robert Walk Jr. is the creator and sole writer for On Freemasonry and Humble Pie: a Wordpress blog dedicated to his experiences and journey from being a petitioner, to Initiation, Passing, and to being Raised. A dialysis technician being his main work, he enjoys writing, rock climbing, drumming and craft beer in his free time. He is a Master Mason at Jephthah Lodge No. 222, A.F.&A.M. in Essex, MD. Remember Geraldo Rivera when he was on live TV to open Al Capone’s vault to reveal all that treasure? Homer Masonic Lodge No. 199 (IL) recently had our own version of this show. We all knew there were a lot of things in the attic of the Homer Masonic Lodge. The building was constructed in 1892 and has been used continually by the lodge since that time. But what was exactly up there was generally a mystery. 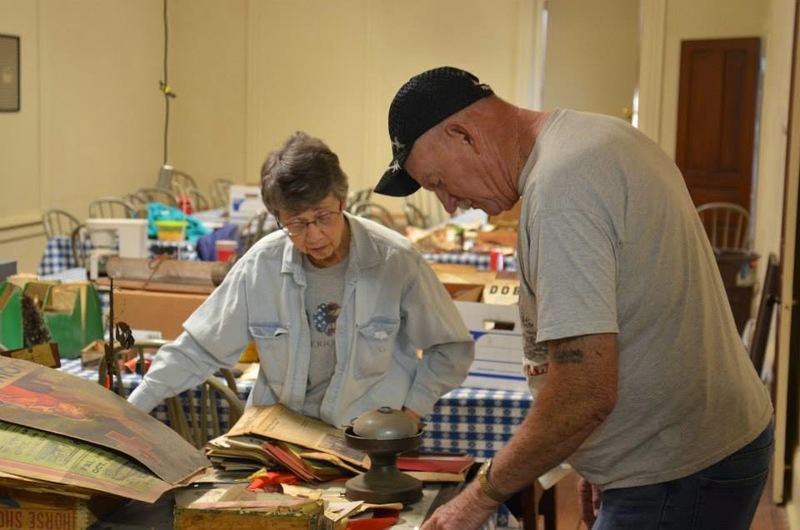 On a Saturday morning, with the help of the Homer Historical Society, members of the lodge decided to bring down all the treasures from the attic and see what they were. We had much better luck than Geraldo did! It was like opening a time capsule from the past with items from 1856 to 1950. 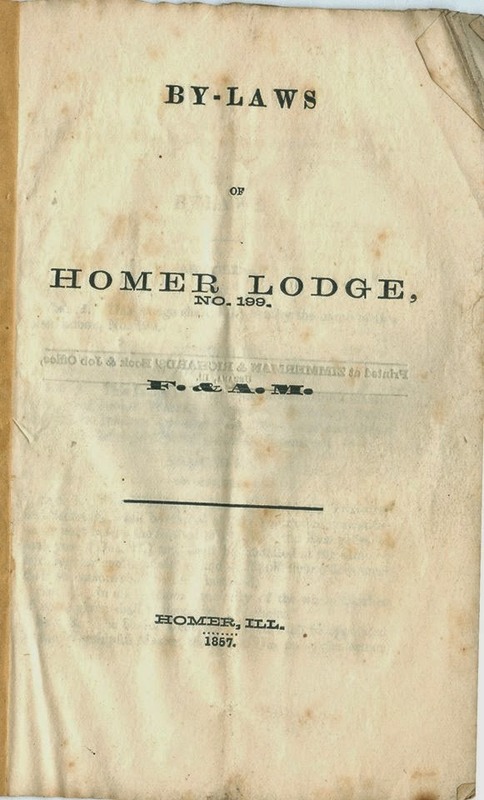 There were Lodge by-laws from the 1850’s, copies of the Homer Enterprise newspaper from the late 1800s and early 1900s, petitions, old Christmas decorations and a large library of Illinois Grand Lodge Proceedings. Homer was also was home to Royal Arch Chapter No. 94 that finally gave up its charter in 2009 and the attic held a large amount of amount of Royal Arch petitions, annual proceedings and minute books. An Eastern Star chapter was also at Homer and there were treasurers from these years as well. Through the careful guidance of the Homer Historical Society, we are now going through all of the papers to get them organized and to be stored in manner that will preserve them for future generations. Homer Lodge No. 199 is now in the process of converting a spare room into a museum so that some of these items can be displayed in glass cases. There were many interesting relics found in the attic that will be featured in this collection, including glass degree slides, phonograph records, a very old top hat worn by one of the Masters, several collections of officer jewels and regalia, old movie posters, etc. There are also some unique lodge furnishings that will be displayed. Ogden Lodge No. 754 recently donated an old altar that belonged to Broadlands Lodge (no longer in existence) that will be set up on display in the museum. Homer Lodge is going to have the music on this old phonograph record, one of several discovered, digitally mastered and preserved by the University of Illinois Library. Like Homer Lodge No. 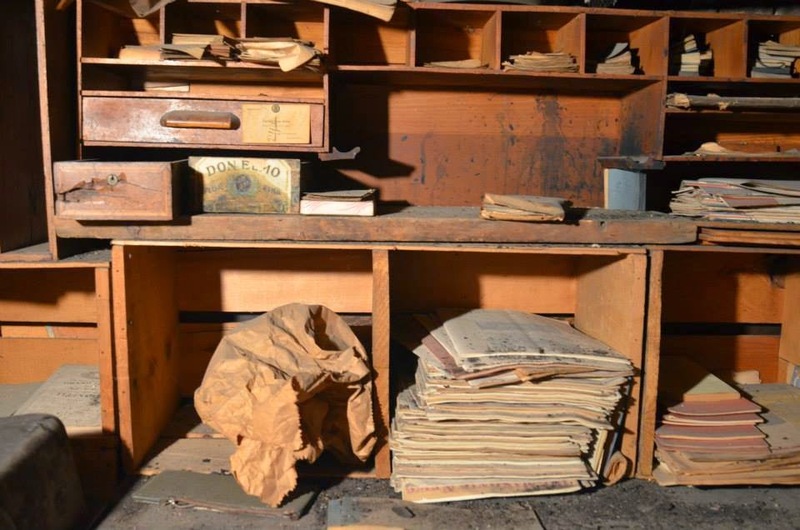 199, many of our old Masonic buildings have been around for a long time, and very few probably know all the hidden treasures they contain hidden away in desks, attics, basements, and cupboards. So take a little time, and have a look at what your lodge may have tucked away in boxes and file cabinets. And if you're not sure what you have, contact your local Historical Society, and I'm sure they'll be anxious to help you go through what you find. What looks like junk to many people may contain very important lost pieces of history. The Homer Historical Society has already found a number of newspapers and documents that were up in the attic that they didn't have in their collection. Some of those items may very well shed new light on what life was like in our part of Illinois more than a century ago. I don’t much care for long car trips, but sometimes they’re necessary. In November, my son, Jacob, quite to his surprise, came in first in Illinois DeMolay’s Fall Fest competition in Preceptor Five, Junior Division. He was, of course, delighted and proud, as were his mother and I. As state champion, he became eligible for Heartland Tournament of Champions, which was held on April 25 in Michigan. So, on Friday, Jacob and I, with his sister Kate and four of her stuffed animals, drove about eight hours to the hotel where the tournament was to be held, checked in with the Michigan DeMolay advisors, and found our room. The kids spent some time in the hotel pool, we had dinner, and then went to bed. The next morning, we found a Panera, had breakfast, got Jacob into his suit and robe, and went to the room where the individual Preceptors were to compete. Jacob was the first one there, and, after the judges explained the rules to him, he performed his ritual. We couldn’t stay till the awards ceremony, since I had another meeting on Sunday back in Illinois, so we hit the DeMolay store, bought a few things, packed up, and hit the road for the return trip, arriving back in Tuscola at 5:30, with a stop at a Bass Pro Shops store in Indiana, where the kids had a wonderful time without buying anything (although Kate begged). Jacob was happy it was over, and both kids were glad to be home. I found out the next evening that he’d placed second, which he thought was just great, and he was ready to tackle some more ritual for the next Fall Fest. I figure he’ll be ready for the Magnificent Three (three Preceptors, recited one after the other), and he agrees. He’s looking forward to it, and he’s learned a lot. So have I. I’ve learned that I probably need an attendant chiropractor if I’m going to drive more than about 400 miles in a day. I’ve been reminded that Bass Pro Shops has a toy section that Kate has demanded that we visit again, with money. I’ve learned that Jacob is capable of amazing things. I’ve discovered again that DeMolay is the best organization for young men I can imagine. And I know without question that my own Masonic career is a pale second place to what I can help my children accomplish. I drove nearly 900 miles in the space of thirty-three hours so that Jacob could do something for five minutes. With any luck, I’ll get to do it again. R. W. B. Michael H. Shirley is Assistant Area Deputy Grand Master for the Eastern Area for the Grand Lodge of Illinois A.F. & A.M, as well as a Certified Lodge Instructor and Leadership Development Chairman for the Grand Lodge of Illinois. A Past Master and Life Member of Tuscola Lodge No. 332, a plural member of Island City Lodge No. 330, F & AM, in Minocqua Wisconsin and he is also a member of the Illinois Lodge of Research, the Scottish Rite, the York Rite, Eastern Star, and the Tall Cedars of Lebanon. The author of several articles on British history, he teaches at Eastern Illinois University. From the day I knocked at the outer door of Lakes Chapter, Order of DeMolay, seeking light in the Masonic family there has always been one reoccurring theme: Love. There are many references to our mothers throughout Masonic education, however none seem to touch on the love for our mothers the way that the DeMolay ritual and ceremonies do. In a Lodge room setup for DeMolay, you would notice seven candles standing as sentries about the altar. In the Light Ceremony, we learn that “the first candle is representative of the love between a parent and a child, even prior to being born”. This unconditional love was called Agape. In the Nine O’clock Interpolation, it is in the first line that the Master Councilor references “mothers bending above the beds wherein lie the children they love”. During the initiation, candidates take charge of the Crown of Jewels, and learn the first jewel placed there on is the Jewel of Filial Love which is dedicated to our mother’s and the debt to them that we could never repay. When we are initiated, passed and raised into the Light of Freemasonry, we build bonds with the Brethren around us and inevitably, their families, becoming part of the “Masonic Family”. In the obligation of a Freemason, we learn that a man's duty to his family is paramount. Given that we consider one another Brothers, so should we consider their Wives our Sisters. A Brother’s Mother is revered as much as you revere your own. Their children protected as though they were your own. In the true Masonic Family, just as sure as night follows day, women must be considered an important and equal contributor to our Fraternity. And I don’t just mean tolerating us being away for stated meetings, practices and Grand Lodge Sessions. Without Women, there would be no Man, and thus no Masonry. If you are ever blessed with being able to witness a DeMolay Chapter preform the Flower Ceremony, it will not soon be forgotten. There is rarely a dry eye to be found. Below is an excerpt from that ceremony. “Dedicated to our mothers, whose love never fails. You may rise to positions of great influence in commercial, political, or professional life, but you can never reach the heights of your mother's secret hopes for you. You may sink into the lowest depths of infamy and degradation, but never below the reach of her love. The memory of it will always stir your heart. There is no man so entirely base, so completely vile, so utterly low, that he does not hold in his heart a shrine sacred and apart for the memory of his mother's love. With a form that is full of grace. With a grave and tender face. It was your mother who loved you before you were born--who carried you for long months close to her heart and in the fullness of time took God's hand in hers and passed through the valley of shadows to give you life. It was she who cared for you during the helpless years of infancy and the scarcely less dependent years of childhood. As you have grown less dependent, she has done the countless, thoughtful, trouble-healing, helpful and encouraging things which somehow only mothers seem to know how to do. You may have accepted these attentions more or less as matters of course, and perhaps without conscious gratitude or any expression of your appreciation. You are rapidly approaching the time in life when you will be entirely independent of your mother. The ties with which dependency has bound you to her may be severed as you grow older, but the tie of mother-love can never be broken. Of feeding you with spirit's tears. But my glad hands have kept you whole. Bound me to life with ruthless bands. That you an aspiring way should find. Which does not stab in me again? Which does not make my pride go lame? Which sears not me with poisoned sting. Remember me in life, O son. Keep that proud body fine and fair. My life is monumented there. For my life hold no woman cheap. For that dark night when you were born." The flowers which adorn the altar are symbols of that mother love. The white, the love of the mother who is gone. And the red, the mother who still lives to bless your life. While from above long shafts of light upon her shine. Her heart is flower fragrant as she prays. May we everyday, strive to make good on that debt that can never be repaid. Bro. Brian Schimian is Life of Member A.O. Fay #676 in Highland Park Illinois and the Medinah Shriners - Lake County Shrine Club. He was also the Past Master Counselor of DeMolay - Lakes Chapter in 1995. Brian is a father of two children. "Start Square, Finish Level"